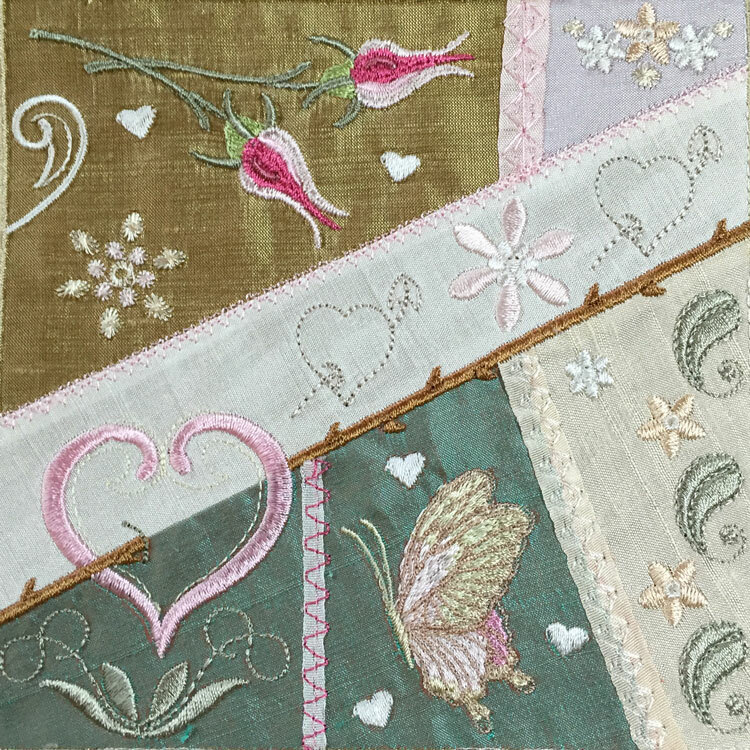 The best way to select appropriate colours for your embroidery, is to lay them all out in natural light and see what works and what shouts “no way”! I was not happy about my little butterfly although the rich colours showed his staggering beauty. I felt he need to be toned down to match the other colours in my block. After much deliberation and several attempts I went for this combination which worked perfectly. I selected Sulky Rayon 1127 medium ecru, 1108 light mauve, 1113 pastel mauve, 1022 cream and 1054 medium dark ecru. 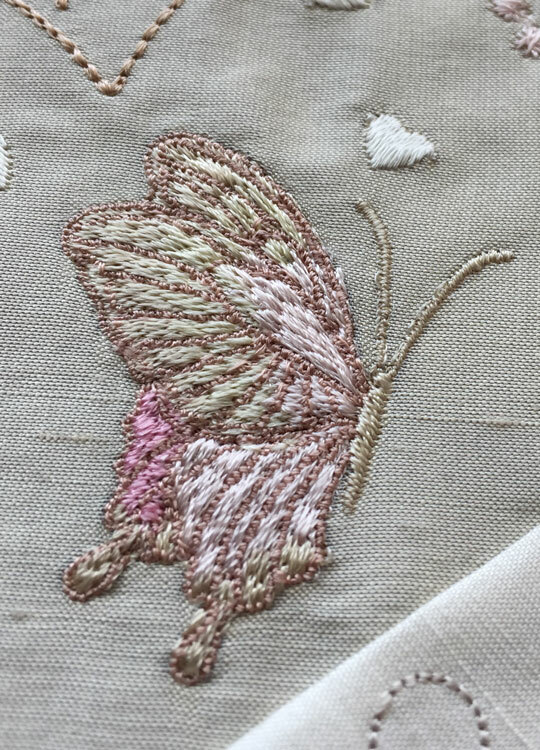 As I was researching possible pastel pink coloured butterflies online, which do not seem to exist except in our romantic notions, I noticed that the antennae were not accurate so these have been altered so they both are forward facing. Here is the finished block before the embellishing begins. Recently I have been using Sulky soft and sheer as my stabiliser for most of my stitch outs, but this time around I went back to stitch and tear, just 1 layer, as I was getting too much puckering and think this may work best for my crazy blocks especially with the layering of fabric and the dense embroidery. The hooped stabiliser gets quite a battering as the hoop is removed numerous times to trim the fabric. There seems to have been more puckering with the soft and sheer, so it will be interesting to see what difference the stabiliser makes. I would now like to show you my smaller block. This photograph shows my redesigned butterfly which is vastly better. Notice the silk ribbon which covers the seams. The 7 mm cream silk ribbon works well on the join on the right. Wider ribbon is a better idea to start with if you have never done this before. Where I have used a narrower one a little misalignment shows up more clearly in a contrasting thread like the deep pink I have used on the left hand side. This 5″ block stitched out with slightly darker fabric. Now the question must be asked what can these blocks be used for at Valentines. I envisage a small tote bag for the smaller block and the larger one could be backed and used for a fold over purse. These blocks will be released very soon, I have only to finish off the PDF tutorial making sure it gives you lots of clear instructions. 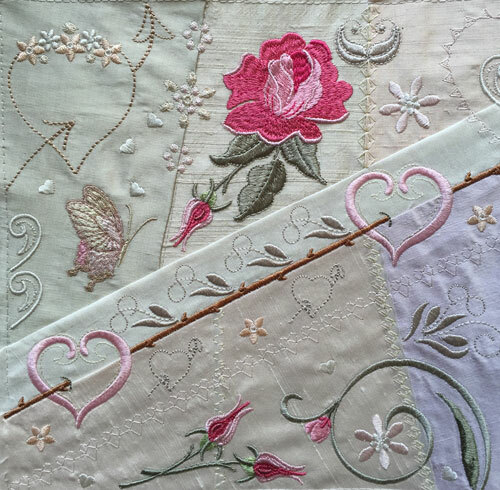 This entry was posted in Discussing machine embroidery, New Designs and tagged combining embroidery designs, Crazy quilting, quilt blocks, Valentines. Bookmark the permalink. I like the colours of the last butterfly. The little Hearts on the diagonal band are genius, very delicate & cute. Thank you! Glad you like the block. Just finishing of the tutorial. Not long now. Indeed, the 3-dimensional quality of the butterfly is enhanced with such a light and airy details that it might fly away. Truly needlework art!